The green answer to tuk-tuks? Many of you will have the privilege of knowing Cory Croymans, either through Reiki at her Asian Healing Arts Centre, through her invaluable membership of Soroptimists International Chiang Mai, or through simply meeting her and becoming friends. Some of you may not be aware that, as well as the above activities, Cory has found time, for the last 6 years, to be a volunteer for the New Life Foundation. Exactly how she has found the time is another matter – certainly Reiki practice will have had something to do with it! Cory Croymans (right) prior to receiving the award, with Khunying Bupphan Nimmanhaemindha, President of the New Life Foundation. This wonderful woman is well known to and loved by many Chiang Mai residents, including the Chiang Mai-based staff of this paper, who were thrilled to receive an email from her last week telling us that she had been selected to receive an award from the Governor of Chiang Mai for her 6 years’ work with the New Life Foundation! 50 persons were to receive the award for their volunteer work – Cory was the only foreigner. She received her award at the New Life Foundation’s offices at the Buddhist Library on Thapae Road last Tuesday. The Chiang Mai Mail (joined, we’re sure, by everyone who knows her) is overjoyed to have the opportunity to congratulate Cory on this well-deserved recognition of her selfless and caring service to those truly in need. The New Life Foundation was established in its present form in 1964, with the support of the Thai and USA governments, and the aim of assisting the rehabilitation of patients who had recovered from leprosy or from mental illness, helping them lead a normal life and find gainful employment. In its original form, the charity was founded 40 years ago through the inspiration of Khunying Bupphan Nimmanhaemindha. Khunying Bupphan, now 86 years of age, is still its president, having worked tirelessly and successfully over the intervening years for those unable at first to help themselves. At present, there are three village-style complexes; the Trisapawakarn Village Complex in Chiang Dao, now self-sufficient, the New Life Village Complex in the Lee district of Lamphun province, and the Halfway Home Village in Hang Dong. The Chiang Dao village includes a Public Welfare School for hill tribe children, which now has boarding facilities for 800 students whose villages are too far away for them to travel to school every day. 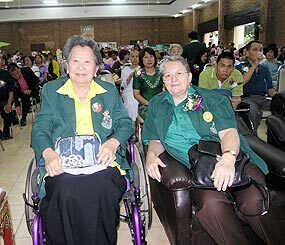 In addition, at the Chiang Dao and Lee villages, medical services and care are provided to 70 elderly disabled ex-leprosy patients who have no other means of support and no-one to take care of them. The Foundation provides much-needed benefits to all the residents, from young to old, of the three village complexes, including monthly allowances and distributions of rice, monthly medical follow-up visits and medical services to families, including hospital transfers where necessary and education in fundamental healthcare and vocational training for the children. In the Lee and Chiang Dao villages, pre-school childcare services including nutritious free lunches are also provided. The focus of the Foundation remains as it did at its inception – to encourage and ensure that recovered sufferers are able to lead a normal life and face obstacles by themselves, by teaching them how to re-integrate into society. At the same time, the Foundation urges the general public to acknowledge them and to avoid discrimination. Each member of the villages has the right to own a piece of land on which they can build a home, which can be handed down to their children. Members are encouraged to work their land. The Foundation also works jointly with Lampang’s region 5 Leprosy Centre in treating the disorder, with doctors from Phrapadaeng Hospital making regular visits to sufferers. For suitable students, there is now a scholarship fund available to enable secondary education where advised and wished. From this brief description of the Foundation’s work, its caring, and its aims, it can be seen that unfortunates who have suffered from two of the most feared human diseases, leprosy and mental illness, are receiving the support and practical necessities essential in reclaiming their lives and living them to the full. For more information on the New Life Foundation, to donate, or to help in any way, please visit www.asianheal ingartscenter.com or email Cory on [email protected] artscenter.com. To those of us who may be (ever so slightly) overweight – How often have we used the excuse, “I’m made that way?” The good news is that we may have been right! Recently published results of a study undertaken by scientists at the University of Texas seems to suggest that some women do actually have a chemical imbalance which prevents them from finding the process of eating rewarding, leading to between-meals snacks or huge portions as a compensation! Wouldn’t you just know that the “goodie” that was used to test 43 young women’s reactions during a year long project was – a chocolate milkshake! Seriously, scientists gave out the delectable and highly fattening drink in order to be able to measure the flow of dopamine (the “reward” chemical) taking scans of the subjects’ brains which showed the flow of blood in the part of the brain which responds to pleasurable input. At the same time, the subjects’ weight was tracked during the year of the study. Results showed that those who got the least pleasure from drinking the chocolate milkshake were those who had gained the most weight. Presumably, they’d rushed home and had three more… Researchers also found that those women who had a genetic variation linked to a lower number of dopamine receptors were also more likely to gain weight. That’s our excuse, then, at least until we read the part of the report which states that nutrition experts point out that the biggest cause of obesity remains lack of exercise and too much food! That’s the bad news – no surprise there, then. Pollution in Chiang Mai is often blamed on tuk-tuks as well as on the annual dry-season burning of anything unwanted, organic or inorganic. India has much the same problems, but seems to be more innovative as regards small solutions; the latest being solar power for rickshaws, another favourite mean of tourist transport. Although this particular innovation was developed mainly to benefit the health and well-being of over 500,000 rickshaw pullers, its further development might bring more widespread benefits. The updated eco-friendly machines were launched in Delhi last week, and won an enthusiastic response from both rickshaw pullers and their customers. Indian researchers are hoping to develop the idea into an advanced version with a solid body, hoping that it might replace the environmentally damaging small car favoured by far too many Indian middle class families. The invention, as it stands, has a zero carbon footprint, but also only has a very small 36 volt solar battery, enough, combined with pedal power, to run for 40 miles without recharging, but far too little to be able to dispense with pedal power. However, if Indian researchers can deal with that problem without raising the cost of a basic machine too much, the pollution potential of many thousands of tuk-tuks across Asia might well be a thing of the past! OPINION: Reconciliation on all levels – Is it too late? At the same time as groups here in Chiang Mai are working to integrate the Thai and expat communities, the ongoing political crisis seems to be creating deep and possibly irresolvable divisions in Thai society itself. Academics, activists and political analysts are showing concern at the fragmentation of social norms, particularly since the violence which erupted earlier this month outside Bangkok’s Parliament building, and referring to the ongoing tension as the worst political crisis in Thailand for decades. Although political discussion, even between family members, has been the norm rather than the exception in previous years, the present situation seems to have resulted in a closing of ranks according to political preference and opinion. Both sides of the present conflict are beginning to be blamed for the escalation of the PAD’s protest, and the manner in which it has been dealt with by the authorities, governmental and otherwise. Human rights activists hold the view that violence is never justified, and that, if it breaks out, all participants are to blame. Which, in human terms, seems accurate, to say the least. However, given that blaming is considered incorrect in Thai society, perhaps it is understandable that discussion of the situation is being suppressed. The problem with such a reaction is that distancing between supporters of either side will increase, making compromise, even amongst ordinary people or family members, ever more unlikely. Bearing in mind that there is a distinct division already between the policies of the opposing sides, and that one side, the PAD, is reported to be composed mainly of the educated and better-off middle classes, and the other side, the present government, is supported by the rural majority, further distancing of the two groups seem undesirable but understandable. Communication is essential when opposing views and the supporters of such views are already so far apart, particularly economically. However, if discussion on a meaningful and straightforward level becomes inappropriate, nothing will change. This, combined with the accelerating effects in Asia of the Western economic crisis, may well spell disaster for Thailand’s developing economy, with its focus on exports, foreign investment and tourism.